time, position (x, y, z) and velocity (vx, vy, vz) using Cartesian coordinates for instance. The problem is also inherently “chaotic” in the mathematical sense, that is extremely sensitive to the initial conditions (butterfly effect). A small loss of accuracy can easily escalate into a complete failure to reach a destination. The navigator’s station is fundamentally a map. However it is not a static one (nor is it slaved to real time) because a static (or near static) 3D view would be a truncated representation while all objects are constantly moving. Instead the primary characteristic of the display is that time can be freely swept forward and backward. This way you can properly visualize the dynamics of the problem and why the “4D” label i.e. 3 dimensions of space + time. Now switching from time to space. All massive celestial bodies generate a gravity field and with it a region within which their attractive force has a dominant effect on all present objects. This region is called their Sphere of Influence (“SOI”) and in your ship’s navigation software space is in effect partitioned into a tree of nested SOIs with the galaxy at its root. Also the trajectory is generally split into multiple legs and each one of them is displayed in its parent’s SOI. This is to easily understand the nature of the motion: a stable elliptic orbit around a moon appears as a complex helix as seen from its parent planet’s reference frame. The continuity of the trajectory across SOI boundaries appears clearly when sweeping time. The trajectory propagator is the heart of the flight planning routines. 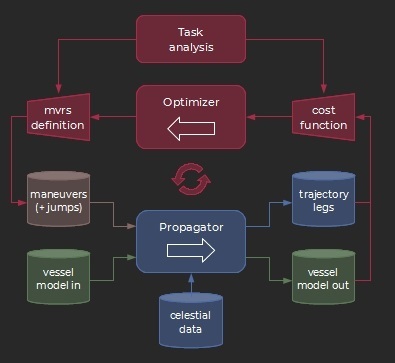 Its role is to derive the trajectory and vessel state over time (mass) resulting from a given set of maneuvers, initial conditions and a ship and propulsion model. → through numerical integration in all other cases (i.e. with multiple acting forces), including when the ship is maneuvering, in an atmosphere or close to a star barycenter (3-body model). Note: the CSN F9’s navigation software treats all maneuvers as “finite” (i.e. not “impulsive” or instantaneous) and the motion is numerically integrated while thrust is applied. 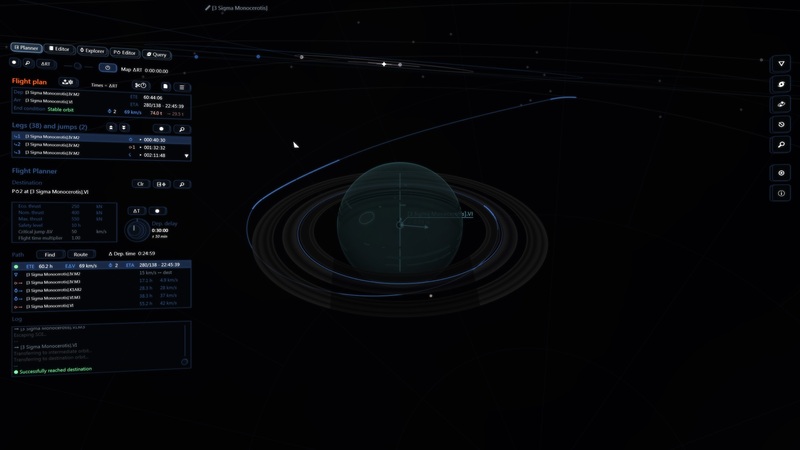 Even in average gravity wells the traveled distance during burns remains significant and neglecting it would lead to unacceptable errors, especially considering that the margin of error for a successful jump is less than 100 m. Furthermore the flight controller uses the computed path as a guidance reference to keep the ship on track during burns. 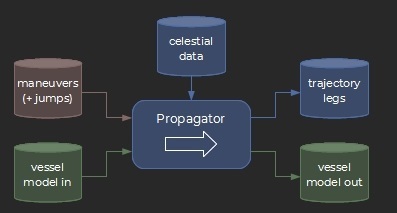 These routines elaborate on the forward propagation model by closing the loop through a numerical optimizer. Typically a maneuver is inserted and its parameters automatically tuned so as to meet the task’s objectives. The process is iterative and similar in essence to the manual method when trying to achieve some specific results. Besides the automation the main difference is a better management of multivariate searches (gradient based instead of variable per variable). Manual and assisted methods may be enough for simple maneuvers and short trips. However long distance flights are much more difficult to plan because of the staggering number of possible transfer and jump options along the way. Manually building and tuning many paths to finally pick the most efficient one is just plain impractical. give it a destination and it will compute a set of maneuvers and jumps to efficiently get there. once a path has been picked the semi-automatic forward planning routines previously described are used to build the trajectory. In case of a non-solvable routing problem the algorithm may retry with a slightly different path (with a limited number of attempts). this characterizes the required minimum collision-free coasting time at a jump exit. A jump solution is not considered safe (and thus discarded) if – without any maneuvering – a collision occurs before the set limit. You might want to toughen the requirement if your ship is in bad condition (in anticipation of possible mechanical problems), or on the contrary lessen the value to help find a solution on complex trips. The log window indicates when a reset is triggered by failed safety conditions. The default is 10 hours. jumps exhibiting a large ΔV (relative motion between the departure and arrival celestial bodies) may require long, hard and costly braking burns to return to a “workable” trajectory. The algorithm uses an internal penalty system to circumvent these paths even when they appear to be optimum. The value does not correspond to a hard limit, you might want to adjust it when a solution is difficult to achieve, typically increasing it for multi-jump trips. The default is 50 km/s. The total flight time to a destination is impossible to predict beforehand since it depends on the chosen solution. As a result the algorithm heuristically derives a nominal time schedule as it is running though the graph of possible paths. The “flight time multiplier” is simply a global multiplier on all the internal time estimations and so you can use it to factor in your mission-related constraints. In general allowing more time reduces the ΔV cost. On the other hand while reviewing the trajectory you may notice situations where the ship remains parked on a waiting orbit before a jump, this is typically a hint that the time constraint may be easily toughened. What to do when no solution can be found? Obviously with a ΔV budget around 100 km/s the ship cannot cross the galaxy on a single run, and longer trips may require refueling stops (additional tools are in the work to help with the related “strategic navigation” planning). Also some locations just cannot be reached, for instance dwarf planets that might not be massive enough to harbor galactic jump-points and still weight too much for in-system connections. Other objects may only get within reach at certain times: this is typically the case of interior terrestrial planets with large orbital velocities. On the other hand such locations are unlikely to be target destinations for your missions. In any case you will always be given the opportunity to carefully study a potential assignment before committing to it. Furthermore as previously mentioned the simultaneous motion of all celestial bodies makes the problem highly dynamic, and consequently it is often interesting to try a sensitivity analysis and check the effects of small adjustments of the input parameters (critical jump ΔV and time multiplier primarily), especially on complex multi-jump trips. The video below demonstrates the use of the automatic flight planner.